Combine arts and technology to create your own music with digital music production. There are many software and hardware options to record, mix, and create your own beats. If you'd like to learn more about getting started with these tools, we've got resources to explore this technology at home and in the community. 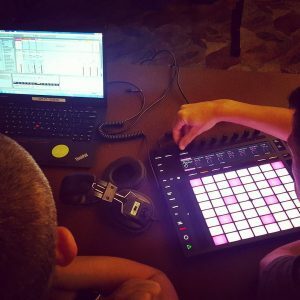 At the library, you can attend a class to learn more about creating digital music with Ableton Push music controllers and the Ableton Live software. Library staff will guide you through some of the basics and let you explore your musical creativity. Read about digital music concepts or get started with some of the tools you'll need to learn. Sound on Sound: Online version of the world's premier music recording technology magazine with articles, reviews, tutorials, and more. Tape Op: Online magazine about the art of recording music, focusing on interviews with creators. IDM Forums: Forum to discuss digital music creation with other creators. If digital music production interests you, think about taking classes in school or pursuing it as a career. Any musical education will be helpful, whether you're playing an instrument or learning about music theory and composition, so explore the elective courses available at your school. There are also a range of college programs and majors that can lead to a career working with digital music, whether at a vocational school, community college, or four-year college.